The Director of the Haydn Society of Great Britain, Denis McCaldin is a conductor and a musicologist. Professor Emeritus of Performance Studies in Music at Lancaster University, he has worked with many major British orchestras including the Hallé, Royal Philharmonic, and Royal Liverpool Philharmonic Orchestras. 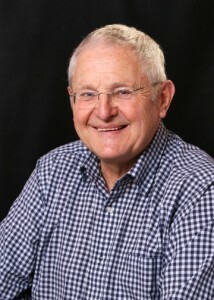 He also conducts abroad and has worked in Australia, Africa, Europe and North America. Through his association with the London Mozart Players, European Union Chamber Orchestra, Manchester Camerata, and other chamber orchestras, he has developed a special interest in this repertoire, commissioning new works and rediscovering forgotten ones. 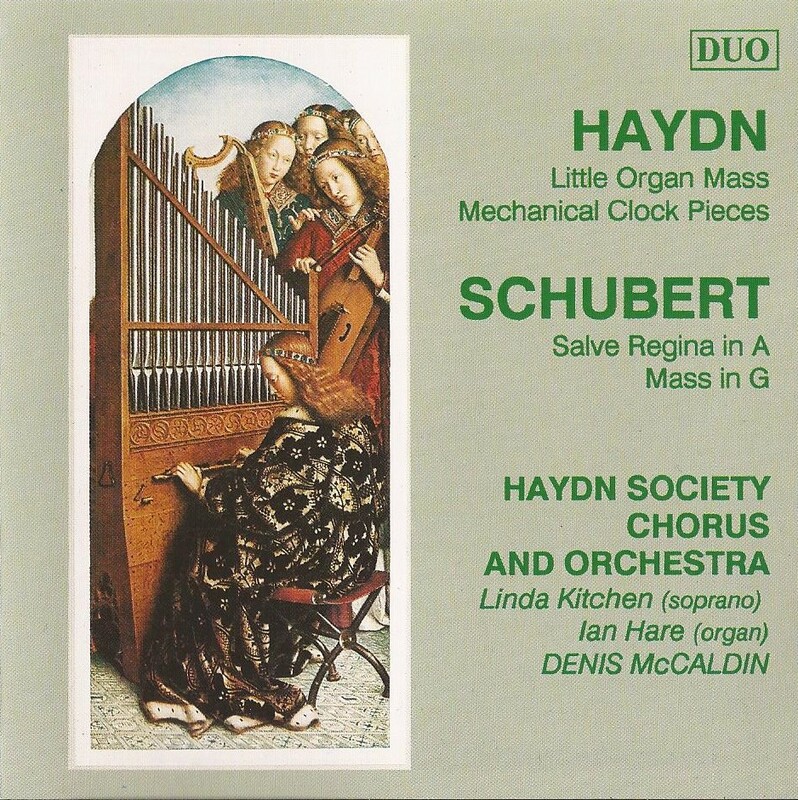 One if his CD recordings of Schubert & Haydn (featuring his edition of the Little Organ Mass) has received a Gramophone Critic’s Choice award. His research interests are centered on Haydn and on choral and instrumental music of the 18th and 20th centuries. 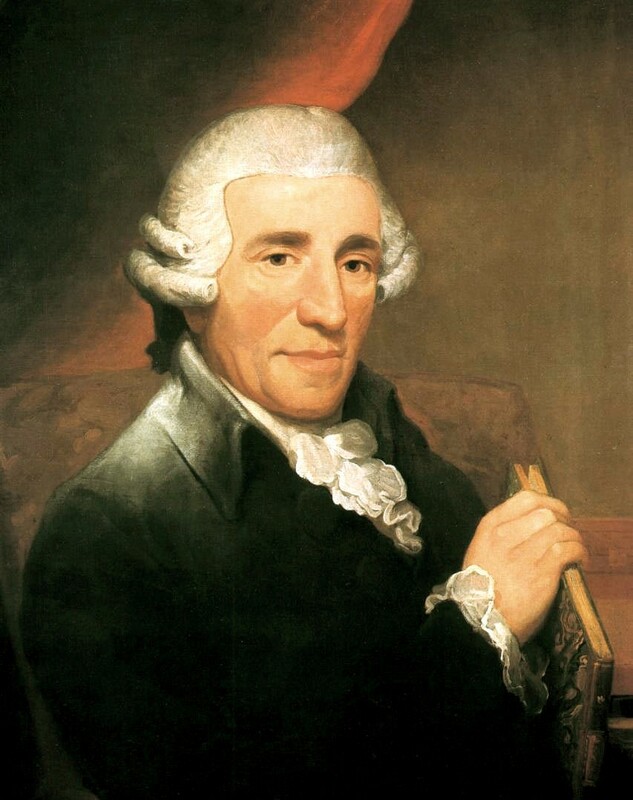 His list of publications features scholarly editions of a number of Haydn’s works including his Te Deum, F major Mass, Little Organ Mass and Nelson Mass (OUP, Faber). He has published editions of choral music by Mozart and J.S.Bach (Faber) as well studies of Mahler and Stravinsky (Novello), and Beethoven’s choral music [in The Beethoven Companion (Faber)]. 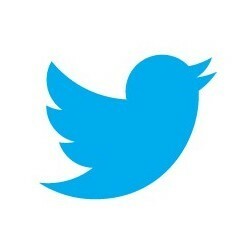 Articles and reviews continue to appear in major journals such as Music & Letters, Choir & Organ etc. Denis McCaldin is also an experienced broadcaster for BBC Radio 3, contributing to special projects such as The Virtuoso Chamber Orchestra and Settling the Score as well as Proms interval talks and magazine programmes such as CD Review. Denis’ also wrote a blog for BBC Radio 3 in the bicentennial year of Haydn’s death, 2009. Current projects include concerts with the Tyneside Chamber Orchestra and outreach work at the Sage Gateshead. For further information please contact Denis McCaldin direct, details via the Membership page. 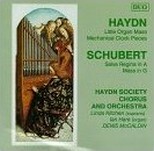 This Haydn Society 2CD set features little-known chamber works from the first and last decades of the composer’s life. In 1786, King Ferdinand IV of Naples commissioned a group of concertos for his favourite instrument – the lira organizzata – a kind of laptop combination of hurdy-gurdy and positive organ. Haydn provided five such works and the King appears to have approved because two years later he asked the composer for a set of Notturni featuring two of the same instruments. 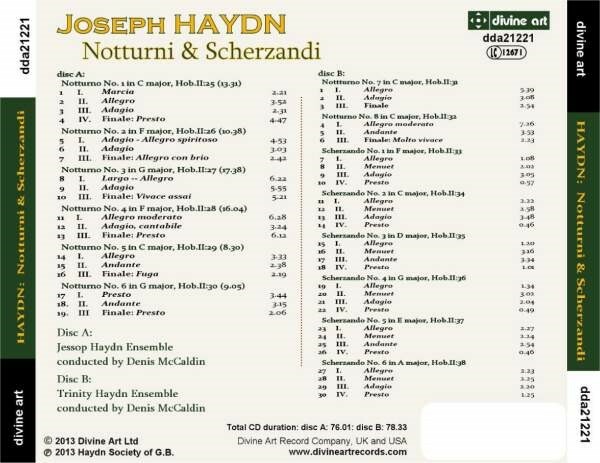 The precise details of this second commission are not known but between 1788 and 1790, Haydn completed nine such Notturni (one is lost) employing two lire, two clarinets, two horns, two violas and basso continuo. This group of eight works for chamber players is in effect a collection of three movement divertimenti. As early as 1765, the Leipzig publisher Breitkopf listed in his catalogue six Scherzandi by ‘Sigr Gius. 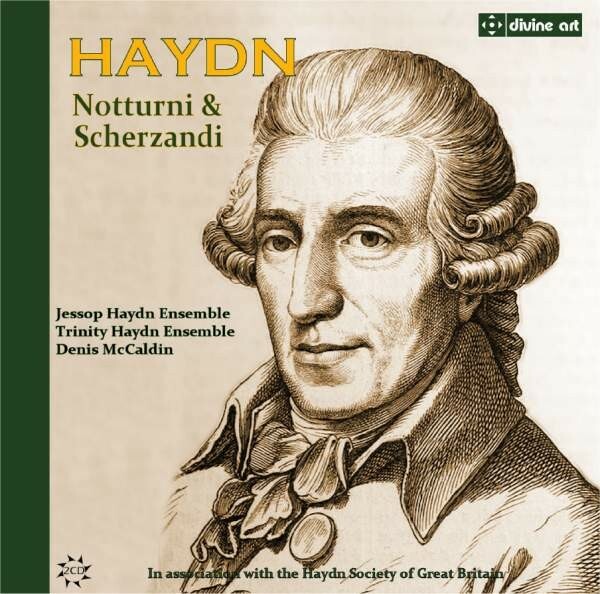 Haydn’. and in his Entwurfkatalog of his own works compiled in that same year we find him listing them under the section containing symphonies. The original reason for their composition is unknown. It is interesting to note that they have a key scheme that couples them together; each pair is characterised by the interval of a fifth: F & C; D & G; E & A. These miniature symphonies are scored for two violins and basso continuo, flute, 2 oboes and 2 horns. Members’ privilege copies are available now for £10 (inc p&p) from the Membership Secretary at the address given on the Membership page. The Trinity Haydn Ensemble and the Haydn Society of Great Britain perform Haydn’s Scherzando No. 1 in F. This performance of January 7, 2009 was given and recorded as part of a collaborative project to mark the bicentennial of Haydn’s death. 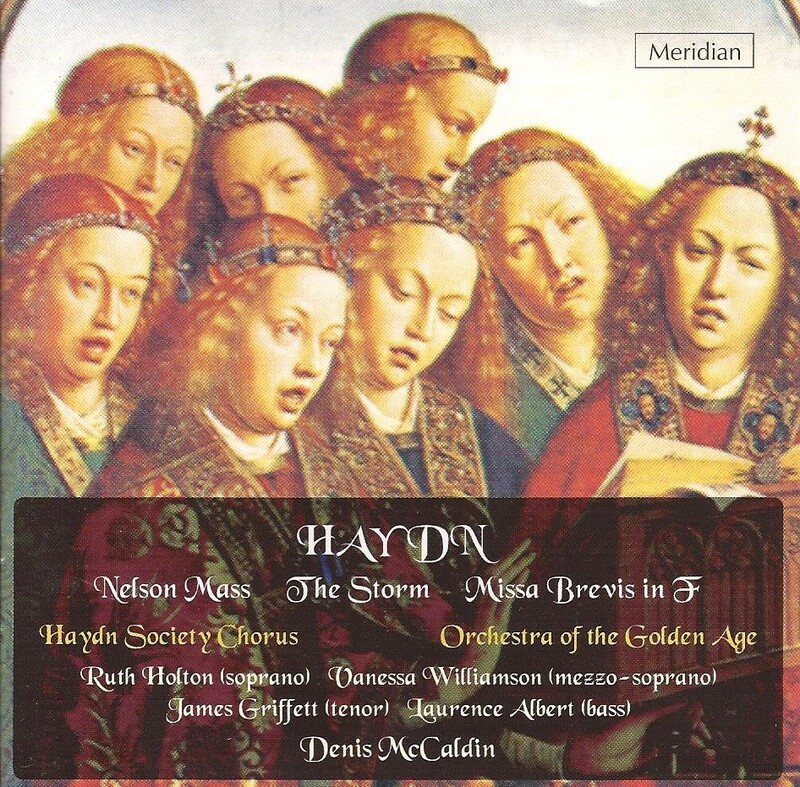 Denis McCaldin conducts the Trinity Haydn Ensemble. 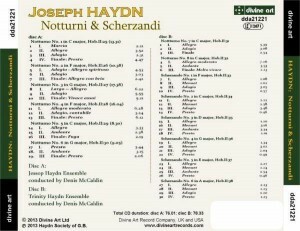 For the Haydn Society of Great Britain: Geoffrey Addis (engineer), Antony Hodgson (producer).